DRC’s Roll-&-Go rental program offers rafts, inflatable kayaks (duckies), stand-up paddle boards (SUP), raft frames, paddles, oars, and most things in between. A shuttle can be arranged to accommodate up to 10 people for an additional $20 with raft or inflatable kayak rentals. We offer single or double inflatable kayaks, aka duckies, for you to book for a few hours or the whole day. Includes the use of lifejackets (PFDs), paddles, and helmets. Defiance offers NRS Thrive SUPs. These are a great all-around board fit for all skill levels on both flat- and whitewater. Includes the use of a lifejacket (PFDs) and paddle. Maybe you’re headed to Westwater and need to gear up. Or maybe you forgot the most important piece of river gear for your float from Grizzly to South Canyon? (How could you forget the cooler?) Whatever you need, chances are we have it. Give us a call and we’ll see what we can do to help you out. 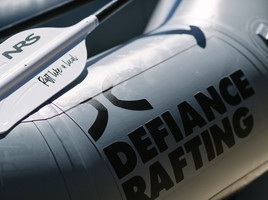 Note: extra gear can be rented at the Defiance Boathouse and is available on a first come, first served basis.